By now you should probably be sick of Sunset. After three separate reviews, we’re a little tired of it too. But when a VIP like Bunky rolls into town, it calls for three things: intense Lost discussions, spinach artichoke dip and coconut-lime margaritas, all of which can be had at Sunset Cantina (the Grill & Tap, which we also enjoy, just doesn’t have the marg power that we need). 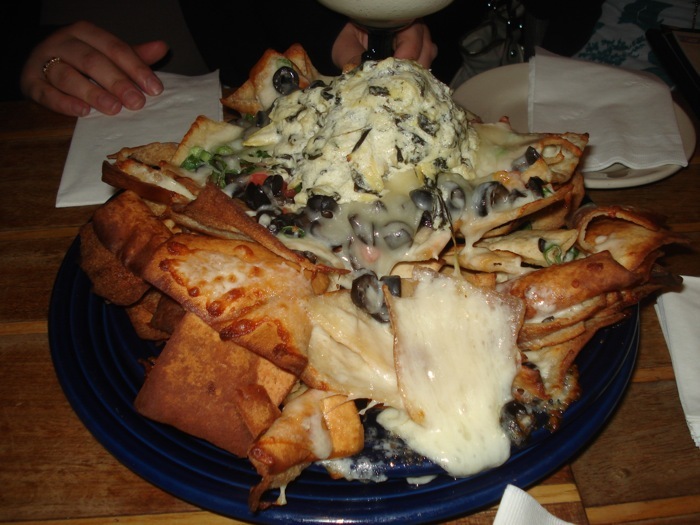 While not explicitly called nachos on the menu, these are nacho enough for us, with pita chips covered in melted cheese, black olives, chopped tomatoes and creamy spinach and artichoke dip. Appearance: (6.5) Me oh my! Not the traditional color palette and the pitas look a little burnt around the edges, but did you see that avalanche of melted cheese nearly spilling off the plate? Days later, we’re still drooling. Quality of Ingredients: (9) Even when overdone, the pita chips are still delicious, thick and hearty enough to really handle the spinach artichoke dip on top. The cheese was excellently melted, and the tomatoes and olives did a nice job adding some variety in texture and flavor. The spin dip was delicious but we were a little weirded out that it was cold, not warm. Distribution of Toppings: (7) Last time we ate these, we had to ask for some extra spin dip on the side because there was simply not enough to go around. We should have remembered that this time because once the glop on dip on top was taken care of, we were left with scores of blank pitas. Had the dip been warm, it might have spread out a bit more and been slightly more accessible, but as it was, there simply wasn’t enough to go around. Price: ( 8 ) $8.89 is a steal when compared to the $12-$13 nachos, and as an appetizer, there was certainly enough to go around. Overall: 30.5/40 Once again, a specialty “nacho” makes a serious mark on our official nacho tally. Maybe they’re not as good as Sunset’s nachos, but if you’re in the mood for something a little more creamy, the spin dip might just be the the appetizer for you.